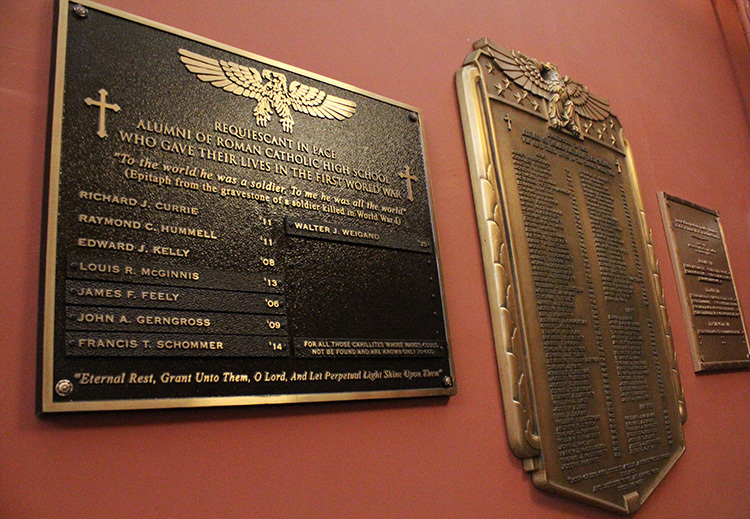 Philadelphia writer Chris Gibbons spoke on the progress of his research into the identities of Roman’s alumni who died in World War I during a talk Feb. 8 at the American Catholic Historical Society. 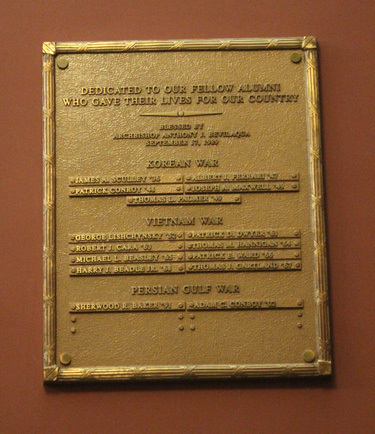 A 1979 graduate of Roman, as a student he wondered why the school had a bronze plaque commemorating the school’s alumni who died in World War II, but nothing for World War I. In that era Roman was the only archdiocesan high school other than West Catholic, which was still too young to have graduates; there were also some tiny parish high schools. It stood to reason if Philadelphia had at least 2,000 war dead some would be Roman alumni. Gibbons lectured on his quest at the American Catholic Historical Society on Feb. 8. His quest started after he read James Carl Nelson’s “Remains of Company D,” which chronicled Company D, 28th Infantry Regiment, 1st Division of the U.S. Army, which on a single day of combat in 1918 in France had 70 percent casualties. This re-ignited his interest in discovering what was Roman Catholic’s sacrifice during the First World War. By way of history, World War I began in July 1914 and ended Nov. 11, 1918. The United States did not enter the war until 1917, and most American troops did not arrive in Europe until mid-1918. Of the almost 10 million military deaths in the war only about 116,000 were Americans, and more than half of those were non-battle deaths, especially from the catastrophic influenza pandemic of 1918 which impacted the entire world. Nevertheless, the American entry into the war tipped the balance of power in what was a virtual stalemate and is considered a key factor for Germany’s capitulation rather than to hold out for a win or a draw. The Meuse-Argonne Offensive that began in late September and ended with the November armistice was conducted by French and American units and was really the final major battle of the war, but at the cost of more than 26,000 American battle deaths including men from Roman. When Gibbons began to research Roman Catholic High’s deaths in the war he started his search through existing records at the school. The 1918 Roman yearbook spoke of a Memorial Mass for those who died, but did not say who or how many. A flag presented to the school by the alumni that year contained two gold stars, representing Edward J. Kelley (class of 1908) and Raymond C. Hummel (1911), which was a start. The 1919 yearbook stated some 14 alumni who lost their life, and a plaque was planned, but it either never happened or it was lost at a future date. It is a strong probability that due to the difficulty in obtaining all the names, it was put off and eventually forgotten. Undaunted, Gibbons began the search by poring over other sources including newspapers of the day, especially the old Philadelphia Public Ledger, which of all the newspapers had the best coverage of casualties. In December 1919 the Public Ledger reported on a Memorial Mass at Roman that honored 32 war dead, but again they were not listed. Whenever Gibbons comes across lists of casualties he cross-checks them against school records for the same name but further verifies through other sources because in many cases there could be more than one person with the same name. Another difficulty is that in that generation most young men who came as freshmen could not stay until graduation and may not have had further contact with Roman. Generally speaking, it was not a matter of academics, but the need to help support the family. School records show that in the first 50 years of Roman’s history only slightly more than 25 percent of the boys who matriculated had graduated four years later. Nevertheless all are considered alumni, and it doesn’t matter if they died in battle, by training accident, or influenza. If they were in the military and lost their lives while serving their country they deserve to be honored, Gibbons believes. 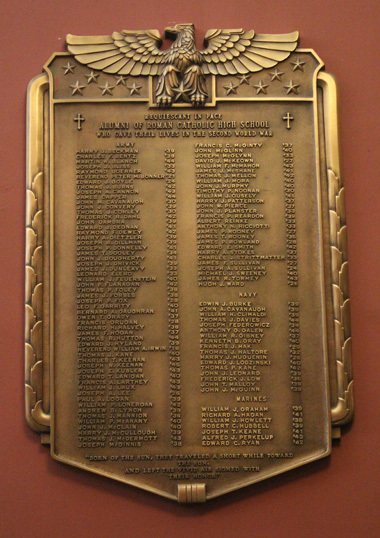 When a World War I plaque was finally installed at Roman Catholic in 2014 it contained only three names. Now it is up to eight. So far, through painstaking research, Gibbons has been able to add to Hummell and Kelley the names of Richard J. Currie ’11, Louis R. McGinnis ’13, James F. Feely ’06, John A. Gerngross ’09, Francis T. Schommer ’14 and Walter J. Weigand ’15. There are many more names out there and Gibbons is determined to find them and give their sacrifice the recognition it is due.